Hvar is one of those islands that lives up to its reputation. It is ridiculously beautiful, sun-soaked and faintly hedonistic, the kind of place where the party lasts all day. Hvar is one of those islands that lives up to its reputation. 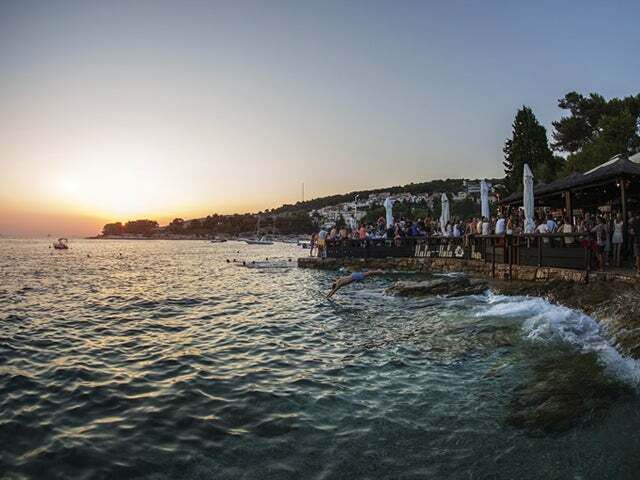 It is ridiculously beautiful, sun-soaked and faintly hedonistic, the kind of place where the party lasts all day. This bar is one of the best places for just such a day, located up the coast from the Hotel Amfora on a reasonably isolated spar of land. The decor evokes the Pacific by way of the Adriatic. There are an abundance of inviting wooden recliners and umbrellas under which to lounge. The bar blends domestic pleasures with superior cocktails for this kind of place, there’s zingly fresh seafood, the music is properly cool and the view is gloriously cinematic, particularly at sunset, when the sea seems to burn. The nature of the place means that it’s only open seasonally.